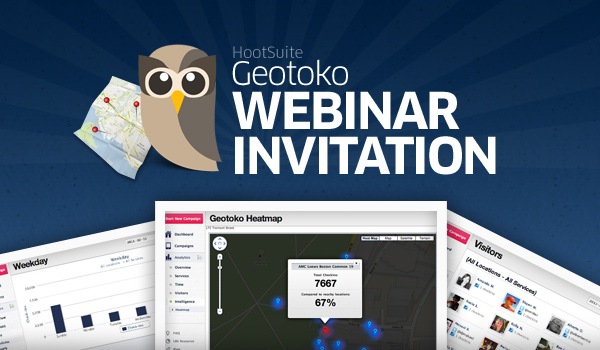 On Tuesday, November 8, 2011 at 10am PST, HootSuite invites users to the first open walkthrough of the recently acquired Geotoko — the geo-location-based marketing software. Webinar attendees will discover how to build & launch location-based promotions across multiple platforms using Geotoko. Learn more about Geotoko’s geo-analytic software designed to help businesses enhance their marketing and further understand audience interactions with their brand. Whether you market for a chain of a thousand movie theaters or a single coffee shop, your customers are actively sharing their experiences with their audience. What are they saying about you and where are they saying it? Use location-based interactions to better understand your target audience and refine marketing efforts to optimize results. With Geotoko, learn more about your customers and how they’ve interacted with your business such as their check-ins, comments, plus see assets like photos they’ve published from their recent visit.